Racquet Specs and Power. Knowing the "specs" allows players to make predictions about performance and feel, and marketing feeds this quest by proclaiming, "Our alpha gizmo makes the frame stiffer, giving it ultimate power," or "Our gizmo expands the sweetspot for supreme power and feel." Really? The whole point of a racquet is to hit the ball. A racquet's power potential value tells you how well the racquet does its job. Power potential tells you how effectively all the racquet's other properties — weight, balance, swingweight, flex, headsize, string pattern, construction, materials, design, and strings — combine to hit the ball with the greatest velocity, comfort, and control. Power potential is a measurement of a racquet's success at fulfilling its life's purpose. 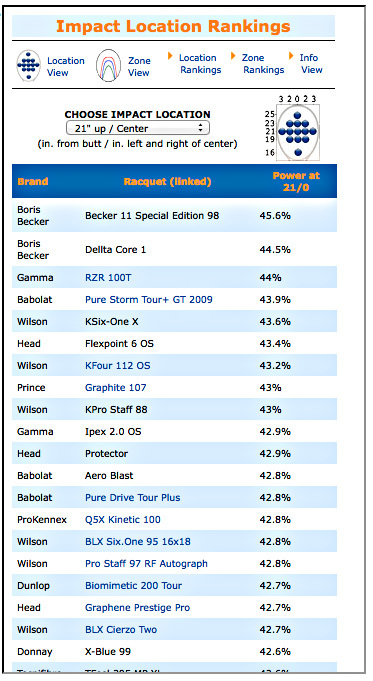 In a sense, this is all you have to know to choose a racquet with maximum performance — almost. Sweetspot Power: power potential at the center of the racquet (G). Periphery Power: power potential at the periphery (E and I). Tip Power: power potential near the tip (A). Throat Power: power potential in the throat, where it is always greatest (M). These locations map out the overall bird's eye view of the stringbed surface. On a closer, zoomed-in view, we have designated an area in the middle third of the racquet as the hitting zone (B, C, D, F, G, H, J, K, L). 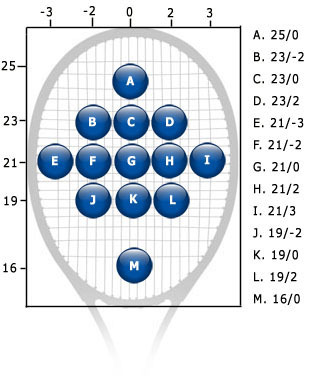 These named locations give us anchor points to use in talking about racquet power. For example, the Babolat Pure Drive has the following power potential values: Sweetspot Power = 41%; Periphery Power = 20.5%; Tip Power = 22%; Throat Power = 51%. In other words, this racquet returns 41 percent of the ball's impact speed (combined racquet and ball speed) in the center, 22 percent three inches out from the center, 21 percent at the tip, and 51 percent in the throat. Surprisingly, the fastest shots do not come from the locations of maximum power (click here for explanation). 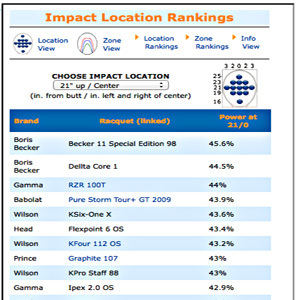 Comparing racquets at the location where you actually hit is what is important. 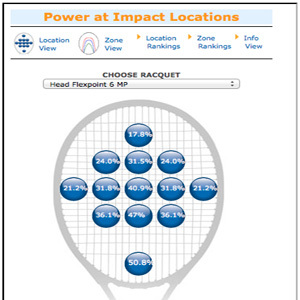 Every racquet has a power potential map indicating the power potential at every location. Below are two such maps — one with high power potential and one with low power potential. A lot can be learned by comparing the two maps. 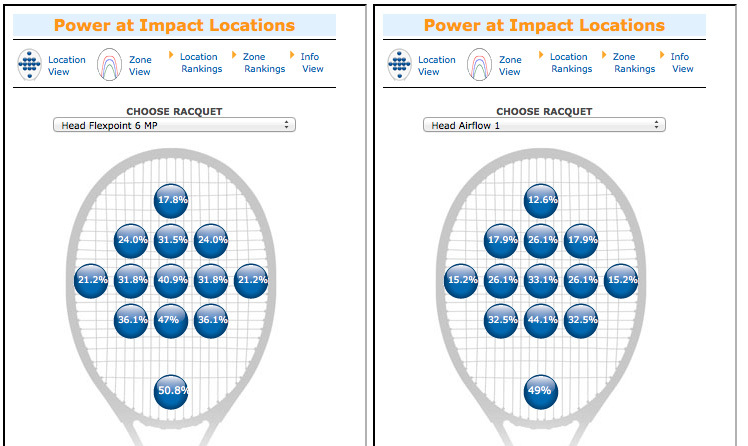 These maps show just how different two racquets can be. They also raise many fun questions such as, "Why does the power potential difference between the two racquets decrease in the throat area?" and "How many miles per hour do I gain or lose on my shots at different power potential values?" and "How much does string tension affect power potential?" and "What happens to power potential if I add lead tape at various locations?" These questions are answered elsewhere. The maps are great, but you will also want to easily compare a racquet's power potential value at each location simultaneously with those of all other racquets. Below is an example of what this comparison looks like for location 21"/0" (location "G"). Change the location on the drop-down menu to see a comparison of power potential at other locations. All these events involve different kinds of racquet movement, or in other words, different types of instability. The more the racquet moves in any of these ways, the less energy it will return and the less stable it will be. High power potential also means high STABILITY. And greater stability means greater comfort and control. Stability contributes to COMFORT because your arm is not feeling the effects of all this movement, and it also influences CONTROL because ball impact is less likely to knock your racquet's aim off target. So a high power potential value also indicates high comfort and control. So, how do you use this magic number to choose a racquet? Unfortunately it is not as easy as simply choosing the racquet with the highest power potential at the location where you make contact with the ball. There is a catch. More than anything else, power potential is determined by mass and mass distribution — in other words, on weight, swingweight, and twistweight. The so-called "best" racquet MAY NOT BE BEST FOR YOU. A racquet not only needs to be comfortable on impact, but it also needs to be comfortable to swing. Swingweight, as its name implies, is the most important variable when it comes to "swingability." The higher the swingweight, the more difficult the racquet is to swing. 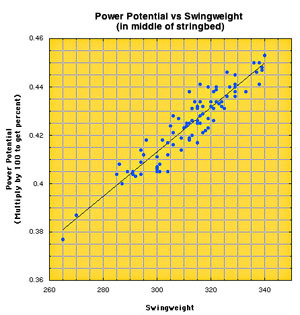 Baseliners generally like higher swingweights whereas serve-volleyers and junkballers often prefer lower swingweight. But what is best for you also depends on your physical strength and the efficiency of your stroke. Step 1 — Swingweight. Considering this important role of swingweight, the first step is to choose a swingweight range — plus or minus 10 percent of the swingweight of your current racquet is a good starting point. For example, if your current swingweight is 300, you would be looking in the swingweight range of 270-330. Step 2 — Power Potential. There are various ways to use the power potential values in selecting your racquet. You can look for the highest power potential in your hitting zone. You can look for the least variability between your hitting zone and the mishit area around it. You could simply look for the highest overall average power potential, thus minimizing the intensity of any mishit. Step 3 — Identify Disqualifiers. Look at the specs of the racquets under consideration. Even if the power potential is out of this world, you don't want to choose a headsize, length, frame thickness, or any other characteristic that is not right for you, whatever the reason might be. For example, spin masters may not want a thick frame and touch specialists may like a softer flex. Power potential is not an artificially created average rating scheme or made-up formula to substitute for lack of data. It is not marketing hocus-pocus or sales mumbo-jumbo. It is the experimentally determined "overall performance" of the racquet. The consequence of every atom that is put into a racquet is taken into account in the results. It is not just a "power" rating. It is an "everything" rating.